Sometimes to think outside of the box you have to get outside of the city! Just a few hours from the San Francisco Bay Area you can unplug, reconnect, and re-energize groups ranging from 25 to 200 people. Opened in Summer 2016, Rush Creek Lodge is a superbly designed ‘destination within a destination’ located at the doorstep of Yosemite National Park, California. Rush Creek Lodge sits just half a mile from the Park’s Highway 120 west entrance, providing an ideal launching point for exploration into all parts of Yosemite. The lodge is just a 3-hour drive from the San Francisco Bay Area along scenic Highway 120, the most direct route to Yosemite from the Bay Area, offering year-round access to the Park. The first new lodge in the area in more than 25 years, Rush Creek features a contemporary, rustic sensibility inspired by the breathtaking expanse of nature surrounding its 20-acre wooded hillside setting. Overnight guests can choose from a mix of 143 tastefully appointed lodge rooms, suites, and hillside villas, all featuring a deck overlooking nature, the majority with sunset views. Take a stroll through our new Virtual Tour! Rush Creek Lodge features customizable, full-service meeting and event space for groups up to 200 people. Guests may select open-air meeting options or indoor settings that can scale from casual to sophisticated throughout the seasons. Groups can just as easily meet in our event hall as in a nearby meadow surrounded by towering pines. Rush Creek’s on-site recreation planning experts enjoy customizing recreation and activity packages for groups, including guided outdoor adventures and team building exercises. Rush Creek’s varied onsite activities and guest areas promote fun-filled, relaxing, informal interactions and bonding throughout a group’s time with us – fostering the important connections desired in a group getaway. Yosemite activities create robust appetites, and our dining and catering options are designed to satisfy with California lodge cuisine that is fresh, thoughtful, delicious and environmentally sound. Our Meetings and Events packages include the use of our facilities, linens, table settings, all set-up, breakdown and staffing for your event. Our on-site professional event and recreation planners and staff help with all the arrangements so you can focus more on your guests and less on logistics. Rush Creek’s on-site Recreation service provides over 30 different guided excursions for all fitness levels plus a full daily schedule of free activities and an endless supply of ideas for team-building, bonding, fear-conquering, and confidence boosting. Yosemite is a feast for the senses, and Rush Creek’s culinary methods follow suit. Our menus embody a flavor profile that is rooted in American dishes with a sophisticated California approach. We serve authentic mountain lodge cuisine that is fresh, thoughtful, delicious and environmentally sound. Our on-site event planning expert and catering team can design all of your meals to suit your group’s budget and dietary realities. As with the rest of your event, we’ll focus on crafting menus and presentations that help realize your vision. Options range from “backpacker” lunches (for your day hike) to a variety of buffets to “mountain elegant” plated reception dinners. Groups can choose the dining venue that suits their needs, enjoying meals indoors or outdoors – or both! No matter where you dine at Rush Creek, you will be treated to invigorating views of the surrounding forest and spectacular Sierra sunsets that pair perfectly with your meal. Please browse through our sample catering menus to get a feel for some of the delicious options that await you. Our grand main lodge houses our main dining room, tavern, and adjoining terraces. The main dining room and terrace can seat groups up to 220, and for more intimate gatherings, our private dining room and terrace can accommodate banquets of up to 60 guests. or (209) 379-2373 x 1516 for menu options, pricing, and further details. Note: the Lodge provides all food & beverage for your event. The grand main lodge at Rush Creek is home to our indoor/outdoor restaurant and tavern, guest lounge, Recreation Desk and planning center, and indoor game room offering fun classics such as shuffle board, foosball, and lever hockey, plus an amazing custom designed treehouse-type play structure for our younger visitors. Next door to the main lodge you’ll find our welcoming reception area and our General Store. The General Store at Rush Creek is well stocked with trail-ready food and drinks, including fresh house-made sandwiches and breakfast items. It’s also a great stop for Happy Hour supplies, games, gear, gifts, souvenirs and sundries. Wandering out and about the property you’ll discover lots of outdoor spaces for play and relaxation, including a fly casting pond and gold panning stream. Try your hand at bocce ball or horseshoes, or stroll around our nature path. Kids will love the zip line, nature-oriented playground and bike paths. We’ll maintain a daily schedule of complimentary activities ranging from tie-dye and leather crafts to stargazing and family-friendly movies. Or just chill out in one of our many hammocks or relaxing fire pits. You can always count on us for nightly s’mores around the fire! Central to the main lodge and hotel wing you’ll find our outdoor pool area. There’s an 80’ x 30’ solar-heated salt water pool and two hot tubs, one family-friendly and one for adults only. The Pool Bar serves tasty snacks, lunch, and a variety of drinks, including fun mocktails! Overnight guests choose from a mix of 143 tastefully appointed deluxe Lodge Rooms or Suites in the main lodge, or hillside villas that are spread throughout 20 forested acres. Every room includes a private balcony with views of the forest and surrounding nature, most also provide a front row seat for stunning Sierra sunsets. All Lodge Rooms feature a stylish sitting area, private deck with forest and/or sunset views, spacious private bathroom with shower, Internet radio, custom artwork and furnishings, Keurig coffee brewer, refrigerator, feather pillows, electronic safe, iPod dock, complimentary Wi-Fi, Earththerapy bath products, hair dryer, and iron. Suites and Villas also feature a cast iron gas fireplace. Meetings and special events can take place at a variety of idyllic outdoor venues or in our main event hall. We are thrilled to bring this magnificent event hall to the Yosemite area! With its high-beamed ceilings, massive picture windows, and walls that slide completely open to let the outdoors in, you’re free to enjoy the best of all worlds. Our main restaurant, private dining room tavern, and spacious outdoor terraces provide groups with great flexibility for both their functions and their leisure time. To get a feel for how the property is laid out have a look at our property map. For rental of additional items for your event that the Evergreen does not have in-house we are happy to coordinate rental of any of the items listed below. For our services, which include coordinating delivery and covering associated costs, we charge a fee of 10% of the rental costs as listed below. Farm Tables and Chairs are included in the facility for meetings, receptions and ceremonies of up to 200 people. Additional tables will be rented from an outside vendors, pricing varies. Prices are subject to change without notice, due to market changes. so we can arrange to discuss your needs and reserve your meeting or event. We offer an array of guided recreation options to help your group have the best possible all-around Yosemite experience. 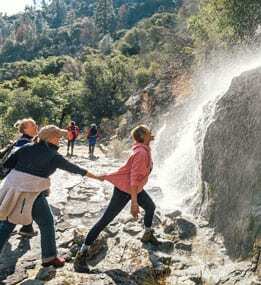 Our on-site professional Guide Service and Recreation Department will work with you to craft a memorable, fun itinerary that showcases Yosemite at its’ finest while meeting your goals and schedule. Hikes of any length and difficulty to lakes, waterfalls, meadows, and scenic vistas. Ideal for groups of any number and experience level as we have dozens of trip locations to choose from. Novices & experts are welcome. Experience the magic of fishing for trout on Yosemite’s beautiful waters. Typically a smaller group experience. Exhilarating outings on the stunning Merced & Tuolumne Rivers. Half and full day options are available. The best place on earth to try climbing! Experience a Yosemite few ever see. Enjoy riding scenic roads on our comfortable hybrid bikes. Biking is an ideal group activity and it can easily be combined with hiking to waterfalls and swimming holes for a ‘multi-sport’ outing. Saddle up for rides of various lengths throughout the Yosemite area. Easily combined with sightseeing and hiking options for a diverse day in the mountains. Van or bus tours throughout Yosemite that can also integrate hiking, horseback riding and naturalist talks along the way. Tours can focus on the park’s most famous attractions, less visited highlights or a blend of both. We can help you meet your goals by integrating team building programs into many of our recreational offerings. Start by selecting an activity, and then we can integrate an appropriate program. A host of other area adventures await, including 18-hole golf, easily accessible, spectacular swimming holes, private wine tastings featuring local foothill wines, photography workshops/tours, and historic Gold Rush community antiquing and shopping. for more detailed information about designing an activity package for your group. Surrounding Rush Creek Lodge are forest, meadows, rivers, swimming holes, fire roads, and vistas. The Big Oak Flat Park Entrance is half a mile away, and the lesser-traveled Hetch Hetchy entrance to Yosemite is seven miles from the lodge. Listed below are drive times from the lodge to favorite nearby places in Yosemite and the National Forest. Yosemite was the first territory ever set aside by congress for public use and preservation. This was done in 1864 by Abraham Lincoln during the Civil War. Yosemite's waterfalls and wildflowers are at their best in Spring. See how you can save up to 20% off your spectacular Spring Yosemite getaway! Sign up here for occasional email updates and special offers.